Landscaping your outdoor spaces could get costly if you purchased every item brand new. Instead, clean out the garage, storage shed and closets to find an abundance of materials ideal for various landscaping projects. Give those unneeded bottles, plates, plant pots and miscellanea a brand-new purpose in your yard as everything from edging to bird feeders to garden art. Edging along a flower bed or small garden helps keep the soil where it belongs. Edge your garden with shells, bits of broken terra-cotta pots or even salvaged tile. Save scalloped shells from visits to the beach to create an ocean-inspired edging for your flowerbed. Clam shells or even driftwood sticks stuck vertically along the border of the garden will work just as well, offering similar aquatic inspiration. Reuse broken terra-cotta and ceramic pot parts to create a border for a flower bed. Stick the broken bits smooth side up -- the former lip of each vessel -- for safety and for the best look. Use those cracked or broken tiles left over from a remodeling project as colorful edging for any type of garden. Place the smooth or colorful side facing out. If using square tiles, align them diagonally for an interesting visual effect. Angle rectangular tiles so they lean against one another. Reuse brick or stone taken from an old walkway or street to create either a flat or raised edge for your garden. 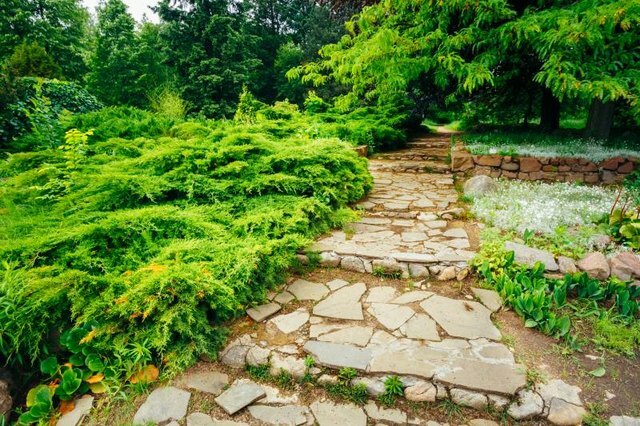 If you have enough material to create several rows of the stone or brick, they can double as a smooth path or walkway around the perimeter of the garden or flowerbed. 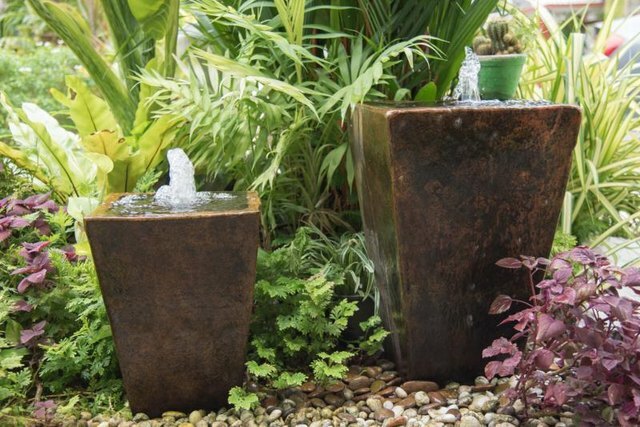 Create one -- or several -- fountains or water features for your yard using repurposed materials. Turn a large ceramic pot leftover from an old plant into a fountain for the garden or the patio. Even a pot with a slight crack can be used, as long as you place a watertight vessel such as a plastic tub or bucket inside it. Use old metal washtub or chipped enamel cooking pot for a slightly rustic basin for a fountain or bubbler. Repurpose a plastic under-bed storage bin into a pint-sized pond for your backyard. Dig a shallow hole for it, then hide its edges with flat rocks or brick, building up the landscape a bit around it. Add a fountain in the center to keep the water moving, which helps prevent stagnation. Add beauty to your yard while providing food and water for birds and other wildlife with homemade feeders and baths. 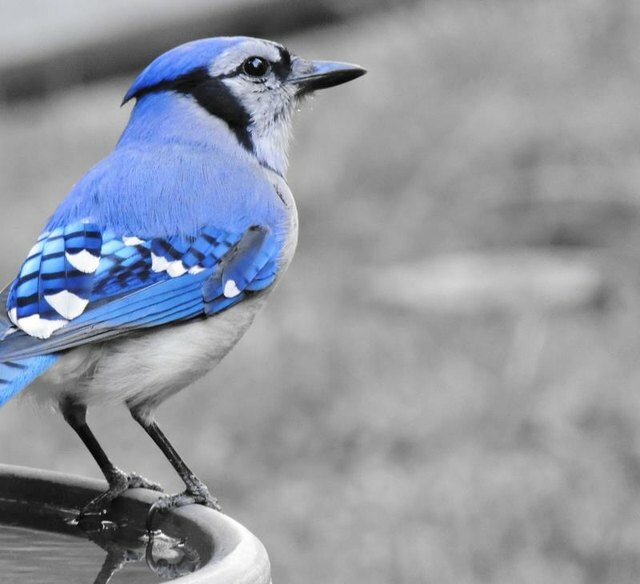 Create your own birdbath from a durable, shallow bowl or pan. Repurpose an old birdbath base or plant stand to house the new birdbath, or make a base from several plant pots stacked bottom to bottom, top to top, stuck together with construction adhesive. Use only very shallow, slightly sloping bowls or pans to provide a safe means for birds to enter and exit the water. Build a hanging-tray-style bird feeder from an old serving tray or handled dish. Add beads to the decorative chain or wire used to hang the feeder. Create a slightly more elaborate version by cutting a hole in the bottom of an old metal coffee pot to dispense the seed into the tray. Make your own decorative hummingbird feeders from glass bottles, stoppers and hummingbird feeder tubes. Wrap thick wire and beads around the outside of the upside-down bottle to decorate it a bit. Use a bit of the wire to create a hanger for the glass feeder. 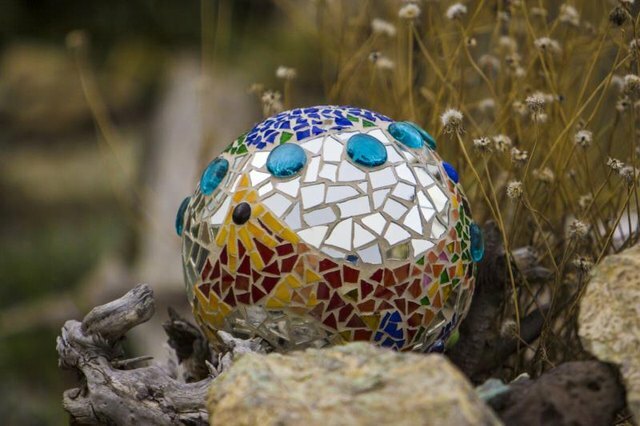 Make art and accent pieces for your yard and landscape by revamping or repurposing various items that may otherwise be destined for the junkyard. Paint old bowling balls with metallic or stone spray paint to create garden spheres if you enjoy the look of orbs in the yard. For a child's garden, paint bowling balls to resemble lady bugs or smiley faces, and set them in places the children can easily find them. Apply an all-weather sealer to the balls to prolong the finish. Turn an old wood ladder or section of fallen picket fence into a trellis to lean up against an existing fence or structure. Even if you don't have any climbing plants, you can use the structure to string party lights or solar string lights for a more festive environment. Make your own mason jar lights to hang on the fence. Use jars of various sizes, drill a hole in the metal ring that goes around the mouth of the jar, then attach a small chain. Connect the chain to a wall-mount plant hook along the fence.